Being recognized as an individual is a great feeling — and it enhances your education experience. You will feel comfortable collaborating with your classmates and, if you need help, your professor’s door will be open. When Mount Royal first opened its doors more than 100 years ago — Sept., 1911 — it welcomed 179 students. Today, some 12,000 credit students take a variety of programs and courses including bachelor’s degrees, diplomas and certificates. 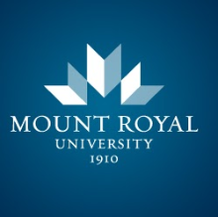 The courses offered have changed over time, but Mount Royal's focus remains the same — providing you with quality teaching and small class sizes. Experience has also taught Mount Royal the importance of preparing students well for life after graduation. That means practical and current information, as well as hands-on learning through work placements, practicum and co-op education. English Foundations (high beginner to intermediate): Strengthen speaking, listening, reading and writing skills. This course is an advanced level preparation for the test that enhances your skills and strategies in four key language areas. It includes the in-class TOEFL iTP® test, a diagnostic indicator of your potential for success. Note: There are also courses to introduce you to the IELTS Academic and General exams. English for Academic Purposes (high intermediate to advanced): Build academic English skills before entering university, college or technical school. Graduates with an 80% average satisfy the English language proficiency requirement for degree, diploma and university transfer programs at Mount Royal University. Enhance your writing skills by using professional business-related phrases, format, and correct grammar when composing common types of business correspondence such as e-mails, letters, memos and reports. Improve your pronunciation for clearer speaking and listening in English. Each lesson includes a focus on (i) general communication skills, (ii) aspects of rhythm including stress, pausing and intonation, and (iii) individual vowel and consonant sounds. and challenge yourself in your choice of study modules. Increase your knowledge of global culture as you learn alongside students from other countries. Designed for visiting international teachers and professors, these interactive 16 hours of classroom instruction are designed to enhance your language skills for teaching in English. By engaging your peers in relationship builders, learning tasks and mini lessons, you gain confidence in your ability to interact effectively and to present information and ideas clearly in a classroom context.